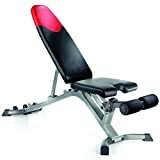 Bowflex Selecttech 3.1 Adjustable Bench Right For You? Bowflex is a long-trusted brand with a variety of equipment which always rates highly among customers. It’s a brand constantly trying to better itself. In the bowflex 3.1 adjustable weight bench, you’ll find a versatile bench with plenty of workout options, made out of commercial quality steel for confidence in your safety and support. Product Features of the Bowflex 3.1 Bench? There are four different positions to choose from a decline of -10°, flat, 45° and 90°, which according to Bowflex allows you to work through more than 30 different exercises. While some other benches on the market have more positions, these are the four main angles which can target all different areas for upper body and core workouts and are plenty for most lifters. Changing angles is straight forward and smooth so you can move from one exercise the next without hassle. The maximum weight capacity is 300lbs. If you need a bit more support for serious lifting then it may be better to invest in a bench with a higher weight capacity. Short On Time ? >>> See it hear on amazon for the cheapest price. It measures 56” x 26” x 20” so it does take up a bit of room. It’s best for somewhere with a bit of space. However for a tall person over 6 foot, you might not be able to rest your head on it when lying down and may need a longer bench. The Bowflex 3.1 itself weighs 55lbs which says a lot about the material it is made out of. Most benches are not close to this because of lesser quality of material used to make a cheap bench. This bench from Bowflex is made out of heavy-duty commercial quality steel and is built to last. The vinyl upholstery is durable and easy to clean – simply wipe down the surface after use. It also comes with a removable leg brace for extra support while working out in the decline position. There are some people who don’t like using a leg brace or find it uncomfortable so with the Bowflex 3.1 you have the choice of attaching it or not. There are wheels attached at the back for ease of movement and rolling away for storage. You’ll need to assemble this bench yourself, but it does come with fairly clear illustrations to guide you. It should take around 45 minutes to put together as everything tends to slot in relatively quickly and without hassle. When assembling, it’s probably easiest to turn the boards upside down and place the frame onto the boards rather than the other way round and trying to get the boards to sit correctly on top of the frame. It comes with a 15-year-warranty on the frame and a one-year warranty on the upholstery. The main gripe with this adjustable bench is the fact the bottom seat doesn’t adjust at all. Given there are two incline positions, I would have expected the bottom seat to be able to angle itself downward. Sometimes you can feel like you’re slipping down the seat when working with the incline and a flat seat. Usually the seat pad should shift slightly up on an angle to accommodate the incline position to keep you in place. Not a big deal over but I thought you would want to know. There aren’t too many adjustable benches with a decline position, but this one is only -10°. While it’s better than nothing, a steeper decline offers you a higher intensity for core work like sit-ups and decline bench press. Keep that in mind if you want a bigger decline degree. Four positions will give you plenty of variety but there really is only one incline position – 45°– other than military, which can be limiting if you mainly want to work the incline exercises. And the last issue is that there is no foldaway storage option with this bench. It won’t fold down flat so you’ll have to think about where you want to store your bench. If you’re a bit tight for space and need a bench that you can store away then you will want to look at a different adjustable weight bench. This generally not a problem because most people will want the gym in the same spot all the time and they have room for it. Find the Best Discounted Price on Amazon here. Is it the Right Adjustable Bench To Buy? Bowflex has offered a solid and versatile bench in its 3.1 series with four key positions – decline, flat and two inclines. It’s great that it has a full 90° position rather than 85° like some other benches offer as their most upright position. The full military angle means stronger support to truly work your upper body and shoulders without having to rely on your core as much as you would at a slightly lower incline. Overall it’s a great price for a trusted brand like Bowflex – and with a 15 year warranty on the frame you can be sure it’ll be a sturdy and solid bench capable of withholding regular heavy workouts for years to come. You will find that amazon has the best discounted prices for the 3.1 if you want to look at purchasing it or read more customer comments about the bench. Difference Between Bowflex 5.1 Vs. Bowflex 3.1? Let me break this down for you so you know the difference between the two as this might influence which model you should get. Positions – the 5.1 has 6 adjustable positions where the 3.1 has 4. The 5.1 has 1 extra decline position and 1 extra incline position. Angles – 5.1 has an extra -17 degree decline position and an extra 60 degree incline position the 3.1 does not have. Material – the 3.1 is a single piece top and the 5.1 is two pieces. So outside of those differences everything else is the same. Given the price is lower than the 5.1 I would personally recommend the bowflex 3.1 adjustable bench over the 5.1. You can get the bench discounted here at amazon or look at our bench comparison article here for more choices. ← Bowflex 5.1 Adjustable Bench – Is it Worth it?